First, we are told that he is Uzbek, having arrived in the United States from Uzbekistan "legally" in 2010. Second, some outlets have suggested that he may be married with two children, but I haven't seen any multiple verifications of that. Third, he appears to have been a Uber driver who they claim had undergone a "background" clearance. Fourth, he appears to have lived in the Tampa Bay area of Florida. These few "facts" we have been told (or shown — as I will explain in a moment) are, or should be, just enough to make us demand a lot more information from our government. Here are a few of those things. Exactly how did he legally immigrate to the United States in 2010? One news report says he won the Diversity Visa Lottery, but that hasn't been confirmed by the Department of Homeland Security. Was he instead a refugee or a "follow-to-join" of someone in his family who was the refugee principal? Did he come as a "fiancé" of the woman who has borne his two children (if that proves true)? It's a fairly safe bet that the federal government will try to withhold the information if he arrived as a refugee or follow-to-join, citing confidentiality or privacy concerns, even though the real reason would likely be embarrassment at more proof of failed vetting procedures and a system that tilts in favor of aliens and not national security. If Uber did a background check on the man before he was permitted to do pickups under the company's auspices, how did they miss the Missouri criminal history information? This wouldn't be the first time Uber's gotten into a mess over inadequate driver background checks. 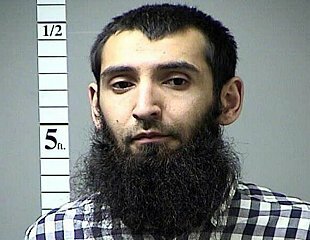 First, consider that if Saipov had been arrested in New York City, the site of the attack and a notorious sanctuary jurisdiction, the city itself would have released him back to the street so that he could go on to commit the attack. Of course, you won't find Mayor DeBlasio speaking to that point in any public appearance. It sure would be nice for some irreverent journalist to ask him to reconcile that. Second, with regard to Saipov, I watched a BBC new anchor interview one of their BBC Uzbek Service reporters. She made the cogent point that, while he appears to have "radicalized" in the United States, he may in fact have left Uzbekistan (a majority-Muslim country ruled by Muslims) due to the government's program of actively monitoring mosques, preachers, and congregations because it is sharply aware that there is a strain of virulent, radical Islam that inevitably results in violence. (Ironically, some Uzbeks successfully claim refugee status based on the government's repressive policies, even though there is clearly a basis for its security concerns.) She made the point that Saipov, if inclined toward such radical leanings, would have had to emigrate to avoid arrest, and therefore chose a country where freedom of religion is guaranteed. It's appalling to think that one of the freedoms enshrined in our constitution would be used against us in this way, but her observations had a cogency to them that's hard to deny. Last, I would note that in his post-attack tweeting, President Trump assured the nation that Homeland Security officials will continue to enhance the "extreme vetting" they have instituted since he took office. I'd like to take that to heart and believe it, but it's too soon yet to have much confidence in a total change of direction in a system that was bent so far to the left over so many years. Time will tell.